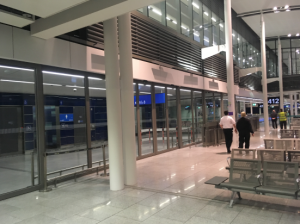 We are proud to announce the recent completion of a Prestigious Project for the Dublin Airport Authorities. The DAA had a specific set of requirements in relation to the intermediate separation of American and European passengers during periods of high demand for American gate allocation in order to increase passenger pre-clearance capability and American departing flights through Pier 4. 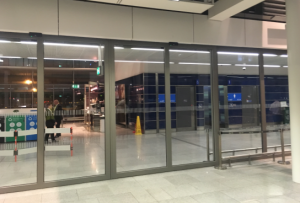 Irish Door Systems were contracted to provide an automated door system for this new Custom Boarder Gate in Terminal 2, Dublin Airport. This was a very complex project with a huge focus on security and a challenging programme. The solution involved the design and installation of large moveable glazed screens and bi-parting doors within a busy live Pier, creating an Automatic Retractable Border Control Wall System. This bespoke system fits seamlessly within the existing environment and when completed looked like it was always meant to be there, which was a particular criteria for the Client. The solution installed aesthetically fits into its surroundings seamlessly. The DAA immensely praised IDS for their work ethic and professionalism on this extremely complex project.